A look at how to complete the Wanted: Splendid Mind bounty in Destiny 2: Forsaken. In Destiny 2: Forsaken, players have been curious as to where they can find Wanted: Splendid Mind. To unlock this Wanted Bounty, you’ll first need to pay a visit to the Spider over at the Tangled Shore. There, you’ll be able to purchase the Wanted: Splendid Mind bounty in exchange for a few Ghost Fragments. With the Wanted: Splendid Mind bounty unlocked in Destiny 2: Forsaken, you’ll need to proceed over to the Glade of Echoes on Nessus and begin clearing out enemies. To make the process easier, we’ve put together a quick guide on where to find Wanted: Splendid Mind in Destiny 2: Forsaken! Wanted: Splendid Mind can be found in the Glade of Echoes on Nessus in Destiny 2: Forsaken. 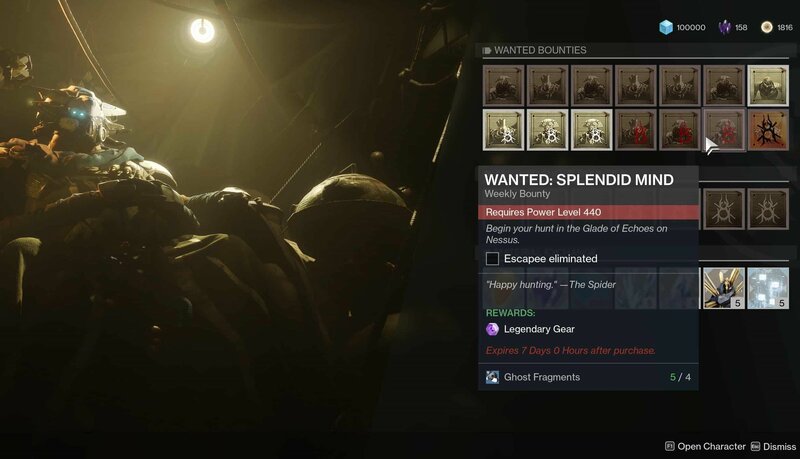 In Destiny 2: Forsaken, players have the ability to purchase Wanted Bounties from the Spider, including Wanted: Splendid Mind. If you have a few extra Ghost Fragments on hand, you can visit the Spider at the Tangled Shore and purchase the Wanted: Splendid Mind bounty. With the bounty unlocked, you’ll then need to work on completing it. By completing this Weekly Bounty, you’ll be able to earn various Legendary Rewards. The lore text for Wanted: Splendid Mind simply reads: “Happy hunting.” This isn’t a lot to go on, especially when it comes to where to find Wanted Splendid: Mind. To actually find Wanted: Splendid Mind, you’ll need to spawn into the Exodus Black region on Nessus. From there, make your way over to the Glade of Echoes. Once there, try to climb up to a high area that offers a look down at the area below. In doing so, you should be able to spot Wanted: Splendid Mind, though this target has the potential to take up to 10 minutes to spawn in once you reach the Glade of Echoes. Wanted: Splendid Mind is a High-Value Target, meaning you'll need to deal damage as soon as possible in order for your kill to count in Destiny 2: Forsaken. Be patient, and when Wanted: Splendid Mind comes into view, immediately begin attacking. It’s important that you take out Wanted: Splendid Mind as quickly as possible as this enemy is known as a High-Value Target (HVT). This means that other players also have the ability to kill this target. If they land hits on Wanted: Splendid Mind before you do, you won’t earn credit for the kill and will then need to wait an additional 10 minutes for the target to spawn again. Once you’ve killed Wanted: Splendid Mind, return to the Spider and turn in the bounty to receive your Legendary rewards. For a visual guide, be sure to check out the video on where to find Wanted: Splendid Mind courtesy of YouTuber Fuzzy Bearbarian (seen below). For more on Destiny 2: Forsaken, be sure to check out some of our previous guides including where to find Wanted: Pandrok, Pillar of Nothing in Destiny 2: Forsaken, where to find Toland in Destiny 2: Forsaken, and how to get the Ace of Spades in Destiny 2: Forsaken. 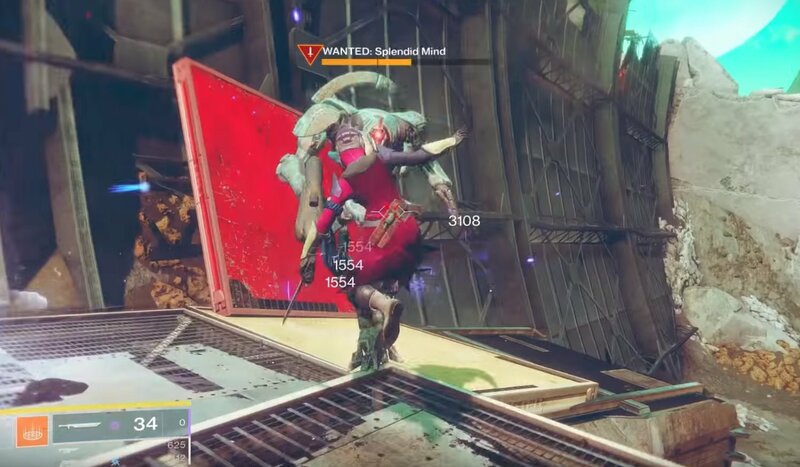 By reading through this guide, you should now know where to find Wanted: Splendid Mind in Destiny 2: Forsaken.